Baked Alaska is one of a small class of magical desserts that are both hot and cold. 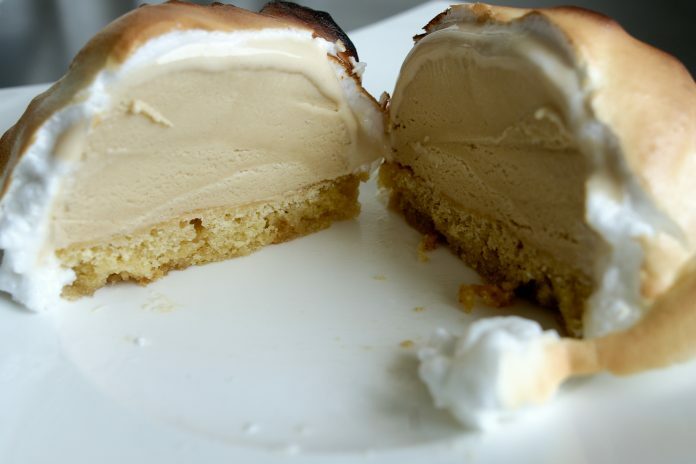 To make a baked Alaska, you put a mound of hard ice cream on top of some sponge cake, cover the whole apparatus with a layer of meringue, and either pop it in an extremely hot oven very briefly, or use a kitchen blowtorch to caramelize the meringue. Either way, the ice cream stays cold and solid because the meringue serves as an insulator for the short period of time heat is applied. (Mexican fried ice cream gives you a similar effect with a different technique, and there are a few other clever ways of combining hot and cold in a single dish.) If you need to recover from Eat Brussels Sprouts Day, eating a baked Alaska is a dandy antidote.